My twist on tandoori incorporates the medicinal benefits of curcumin (turmeric) and cauliflower. You may choose to enjoy seasoned cauliflower plain for a mere 65 calories or prepare the more decadent version with the yogurt and raisin topping. Preheat the oven to 400°F. Line a baking sheet with aluminum foil or parchment paper. Half-fill a large stockpot with water. Add the lemon juice and turmeric and bring to a boil. Add the cauliflower and cook for 5 to 6 minutes, until the florets just begin to soften but are still crisp. Drain the cauliflower well and spread on the prepared baking sheet. Coat with oil spray and sprinkle with the salt. 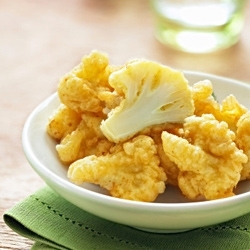 Bake for 7 to 8 minutes, until the cauliflower is lightly browned and fork tender. Garnish with scallions and serve immediately.